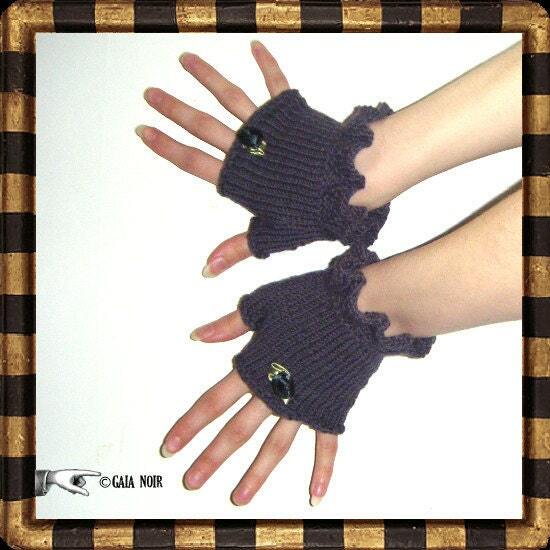 Short fingerless gloves, made in a ruffled Victorian-inspired design. This particular shade of purple was one of the traditional colours of Victorian/Edwardian half-mourning (i.e. after a certain period of wearing only black, it became acceptable to wear purple and grey for a time instead). The gloves are individually hand-knitted and embellished with small, matching black rosebuds. These fingerless mittens are suitably warm for winterwear and the yarn used is a beautifully sort certified eco-friendly type: Amy Butler Belle Organic, a 50% organic wool, 50% organic cotton yarn.